Sprue Picker - Swing Arm Robot for Wedlon Automation Co., Ltd.
Sprue Picker-Swing Arm Robot is extensively applied to plastic injection molding machine 25T ~180T. 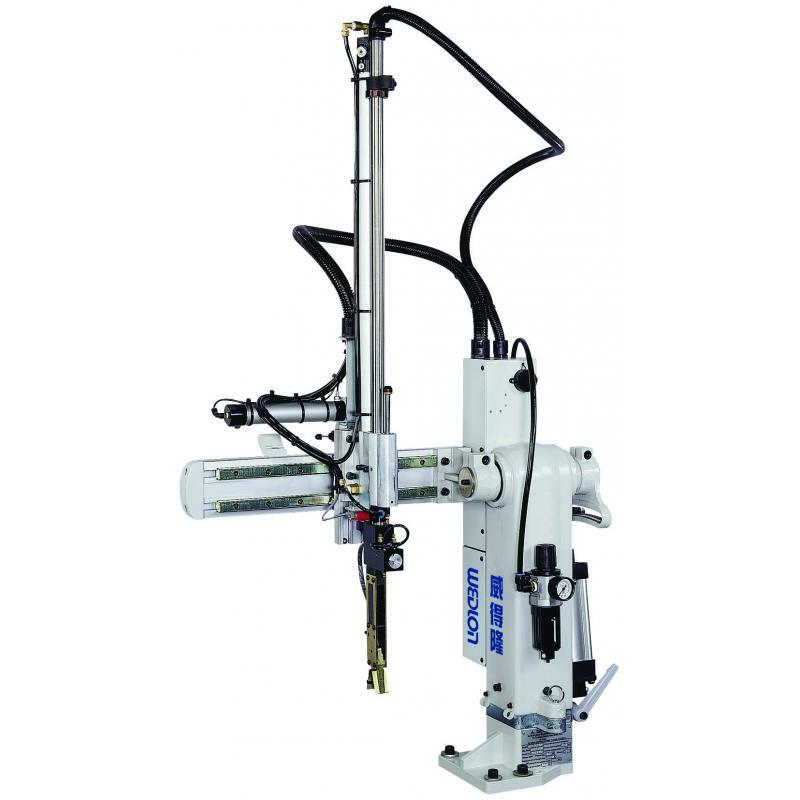 Sprue Picker-Swing Arm Robot can rapid take out the injection runners, sprues and finished products from the mold of plastic injection molding machine. Sprue Picker-Swing Arm Robot can achieve requirement of Plastic Injection Molding Factory Automation (FA). The control system meets CE, SPI and EUROMAP standards, which is compatible with injection molding machines all over the world. Remote controller with the LCD display for easy reading. The screen capacity is 56 English characters. Choice of English / Chinese displays on screen. 16 bit CPU provides powerful editing functions for deletion, insertion and replacement. The program copy function, in conjunction with the edit and modification function, provides easy program editing and modification. 20 sets standard programs combined with 30 sets edit meets requirements for any type of mold. 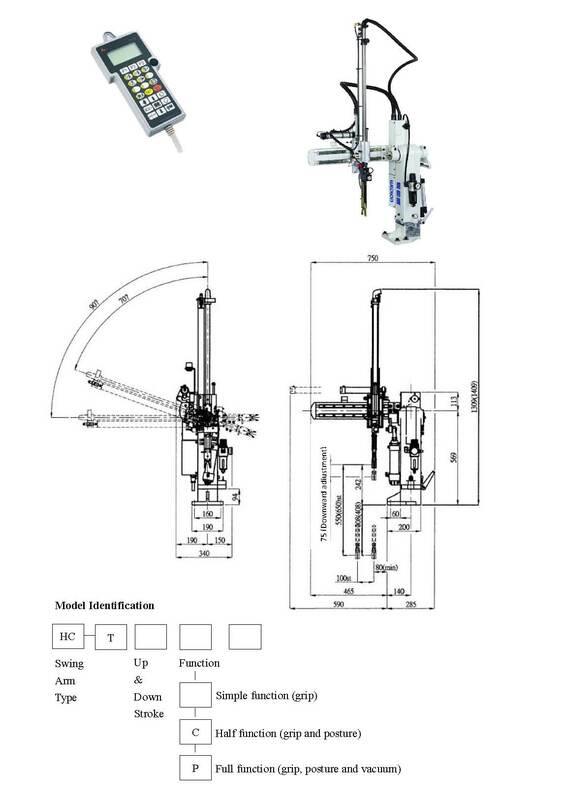 Machine Interface Contains: Mold clamp interlock, injection interlock, mold eject interlock, safety door control, product counting and cycle time. Specially designed outside mold hold function suits extra high molds and molds with core cylinders. This prevents molds bumping against the robot. Middle Platen Confirmation Device (Optional): A safety guard to prevent the middle platen bumping against the robot resulting from incorrect positioning of middle platen. Self-Diagnostic Functions: If trouble occurs, the operator is alerted by an alarm sounding and the trouble is displayed on the control panel. In the event of gripping failure, the operator only needs to open the safety door, take out the product and close the safety door. Then machine motions will restart automatically with no resetting necessary. The arm features anti-drop in case of insufficient air pressure or power failure. Fast Motion: The product extract time is only 0.4 second. Entire cycle time is about 3 seconds. High positioning accuracy and high stability. The robot is precision constructed throughout. All strokes have shock absorbers. Time setting accuracy is 0.01 second. These assure accurate positioning and maximum stability at high speed operations. The arm can be quickly swiveled to 90° forward and backward. The Lubrication: Free air circuit eliminates problems caused by lack of lubrication and avoids oil contamination on the product. Centralized speed control for convenience. Adjustable arm position (165~240mm) increases vertical stroke. The air operated gripper eliminates electrical short circuit problems. Sprue dimensions from 1 to 10mm can be positively sensed. The vertical guide rod is manufactured from SUJ2 bearing steel with hardness up to 60° hard chrome treated for low friction coefficient and lubrication free. Fastest Cycle Time 3.0 sec. Fastest Take Out Time 0.4 sec.